While it isn’t 100 percent accurate, the number of Google searches performed on a product often indicates its popularity in locations across the world. UK autoparts company Quicko has applied the technique to car brand searches throughout 2016, and it shows that when it comes to vehicles, national loyalty often doesn’t play a part. 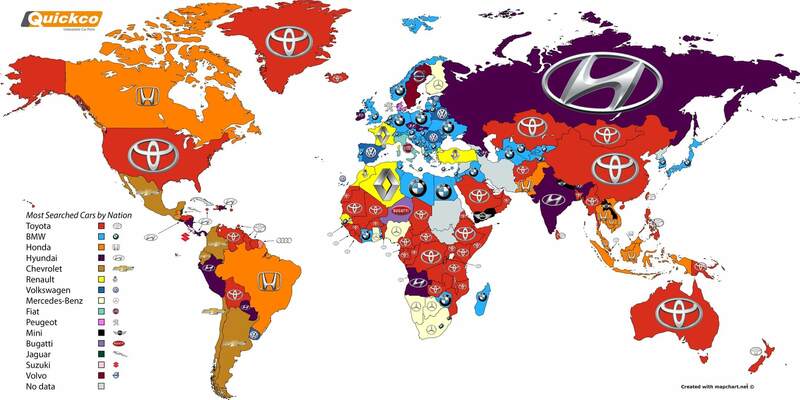 Leading the way as the most Googled car brand in the world is Toyota. The Japanese firm is the most searched-for car term in 74 countries, including the US, most of central and western Africa, China, and Australia. In second place is BMW, which took the top spot in 51 countries. Hyundai, meanwhile, is third – the South Korean firm is most Googled car brand in 17 countries. You might have expected certain car brands to always be most popular in their home countries, but this is only the case in Germany (BMW), France (Renault), Sweden (Volvo), and Italy (Fiat). Interestingly, Volvo and Fiat were ranked highest only in their country of origin, nowhere else. While Chevrolet missed out on being the number one brand in its native US, the company topped Google searches in Mexico, Argentina, Chile, Colombia, and Ecuador. One particularly unusual result comes from the African nation of Niger, where supercar manufacturer Bugatti is the most Googled automaker. It's suspected that the searches are carried out by people who wish to see videos of the cars in action or check out their specs, rather than actually buy one. Quicko has includes one caveat in its findings: Google isn’t the most used search engine in several of the larger economies, including Russia, China, and South Korea - using these regions’ local search engines would have given a more accurate indication of which car brand search was most popular. But Google still has quite a large presence in these nations.